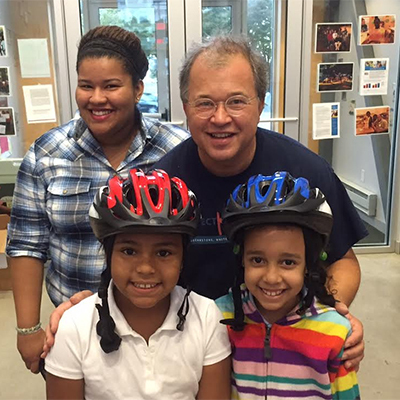 Breakstone, White & Gluck recently donated bicycle helmets to the kids in the afterschool programs at the Tierney Learning Center in South Boston. The learning center and the Boston Bikes’ Roll It Forward program invited us to spend Friday afternoon at the center. Attorney David W. White fit the children for helmets while Boston Bikes’ Roll It Forward staff checked bikes and shared information about bike repairs. Breakstone, White & Gluck donated the bicycle helmets as part of our Project KidSafe campaign, which we began in 2013. Our goal is to provide children who need one with a safe bicycle helmet. This year, we have donated 3,500 helmets to children in Watertown, Somerville, Dedham, Worcester and other communities. The Tierney Learning Center is a hub in the South Boston community, providing early childhood programming, year-round youth programs, adult education and a technology center. Programs include ABCD Head Start, an afterschool program with the Boys and Girls Club, language support classes, adult computer workshops with one-on-one assistance, counseling and career training programs. It also hosts holiday parties, community gatherings and job fairs. The center serves 150 children and families per day. Nearly 60 percent of these households are non-native English speakers while 90 percent are single-parent households. Boston Bikes is operated by the City of Boston. Boston Bikes’ Roll It Forward collects, repairs and distributes bikes to low-income Boston residents who might not otherwise have access to a bike. The program also provides bike safety education with a goal of promoting a healthier lifestyle of increased physical activity and fewer trips by car. The program plans to donate 1,000 bicycles this year, on top of the 3,800 helmets donated in past years. Breakstone, White & Gluck is proud to have supported the program since 2013, by donating bicycle helmets for children who receive a refurbished bike. Learn more about the Tierney Learning Center and Boston Bikes’ Roll It Forward. The Boston personal injury attorneys at Breakstone, White & Gluck have over 100 years combined experience representing clients who have been seriously injured by negligence. If you have been injured, it is important to learn your rights. For a free legal consultation, contact us at 800-379-1244 or 617-723-7676 or use our contact form.